PHPDug Social Poster Automatically Submits Bookmarks to PHPDug Sites List. Automatically submit bookmarks to powered by PHPDug sites list with automated social bookmarking software. 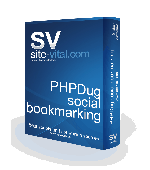 Download Sv PHPDug Social Bookmarking Software by Sv, Inc.
PCWin Note: Sv PHPDug Social Bookmarking Software 1 download version indexed from servers all over the world. There are inherent dangers in the use of any software available for download on the Internet. PCWin free download center makes no representations as to the content of Sv PHPDug Social Bookmarking Software version/build 1 is accurate, complete, virus free or do not infringe the rights of any third party. PCWin has not developed this software Sv PHPDug Social Bookmarking Software and in no way responsible for the use of the software and any damage done to your systems. You are solely responsible for adequate protection and backup of the data and equipment used in connection with using software Sv PHPDug Social Bookmarking Software. WinForexBot - Automated forex bot software made to trade automatically the Forex Online. WinForexBot will analyse the velocity and acceleration of the market in real-time and will trade at your place on the right currencies and at the right moment. AllSubmitter - AllSubmitter is a smart-semi-automated Â©, automated directory submission software package that is used to submit your website to hundreds of web directories quickly, effectively and effortlessly. Increase your site popularity! Internet Submit Hunter - Internet Submit Hunter is a software submission program which help you to submit your software to 500+ software download sites semi-automatically. It provides functions as auto locate the submission page, one click to fill-in form without any typing. Magic Blog - Magic Blog, a simple yet sophisticated blog, is the world's easiest to use blog software. There is no need to register or login, or even submit. Magic Blog uses cutting edge Ajax technology to automatically submit posts and they appear immediately. uSeesoft Video to AVI Converter - it brings you satisfaction while converting video files to AVI format such as converting MP4 to AVI, WMV to AVI, MPEG to AVI, MKV to AVI, MPG to AVI, DIVX to AVI, FLV to AVI, etc. More Software of "Sv, Inc."
Sv Automatic Website Builder - Automatic Website Builder Creates Top Quality Sites Automatically. Forget AdSense ready templates and create top quality sites for high AdSense revenue. Do you still waste days or even weeks working on website content and design? Sv LinkAssistant - LinkAssistant SEO tool - the most effective SEO software. LinkAssistant is the most effective SEO software created for link building and link management. Here's why LinkAssistant SEO tool is the best deal you can get if need search engine.